My Record on Crime Reduction is Undisputed. – Gen Kale Kayihura Commends Self On Handover Ceremony. 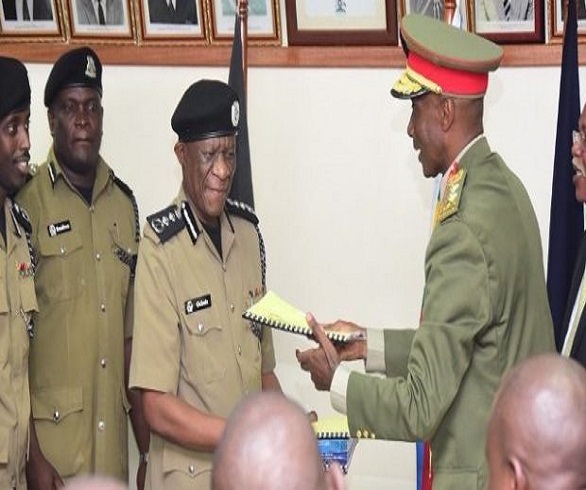 The early morning showers around Kampala have seen Gen.Edward Kale Kayihura hand over power to his successor Martin Okoth Ochola as the Inspector General Of Police. In a ceremony that was held at a Naguru Police headquarters, Kayihura highlighted a series of achievements among which was the reduced crime rate which he says is significant. “One thing am proud of is that during my tenure Crime went down, that one no one can refute.”- Gen. Kayihura said. Kayihura, while speaking about his next move said he is still in the army and ready to serve as a loyal cadre. “I am a loyal cadre, a loyal soldier of the UPDF and that is what I will remain” he said. While speaking to the press incoming IGP Ochola thanked his predecessor for his guidance and support.He called on the media to report positively in support of Police work, and congratulated his deputy Muzeyi on his new role. Previous articleVictor Kamenyo The Barking Dog That Never Bites! Next articlePolice Officer Kirumira Muhammad Buys Rolex To Prove Innocence.